Chronic neglected soft-tissue injuries are not uncommon presentations in sports involving repetitive strains. Triceps is uncommon site of rupture making it least common of all with reported incidence of <1% of all upper extremity tendon ruptures., Most cases occur at tendinous insertion near olecranon resulting in global avulsion requiring surgical intervention. The lesser common locations of tear are intramuscular and myotendinous junctions. Injury to one of the three muscle units of triceps brachii is limited to few case reports and poses diagnostic challenges due to lesser morbidity and functional limitation as compared to total tendon rupture. 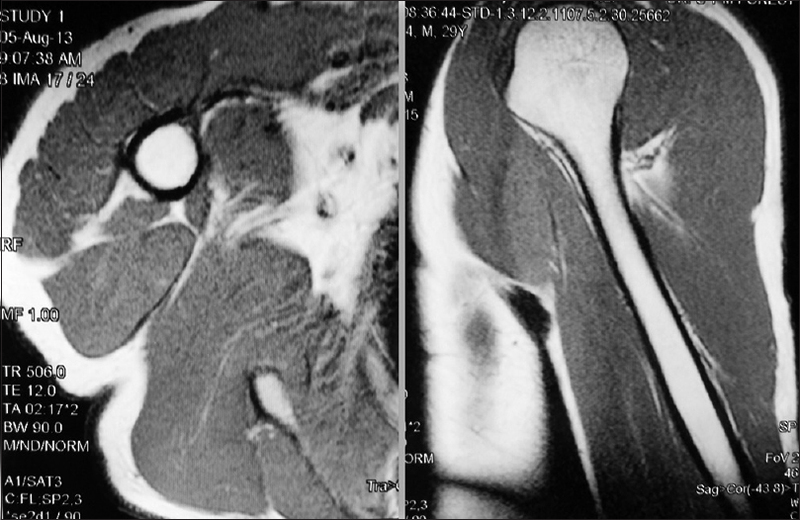 A 29-year-old male javelin thrower just retired from the active sport presented to us with the presence of mass near right axillary region noted during the extension of the elbow. The player could not recall any relevant injury as a causative factor. The mass was painless with no increased temperature and normal overlying skin. There was full functional range of motion with normal distal neurovascular status. The mass was slightly movable in the long axis of arm and less so in coronal plane thus indicating muscular origin. The mass appeared more prominent from posterior on full elbow extension and shoulder abduction [Figure 1]. 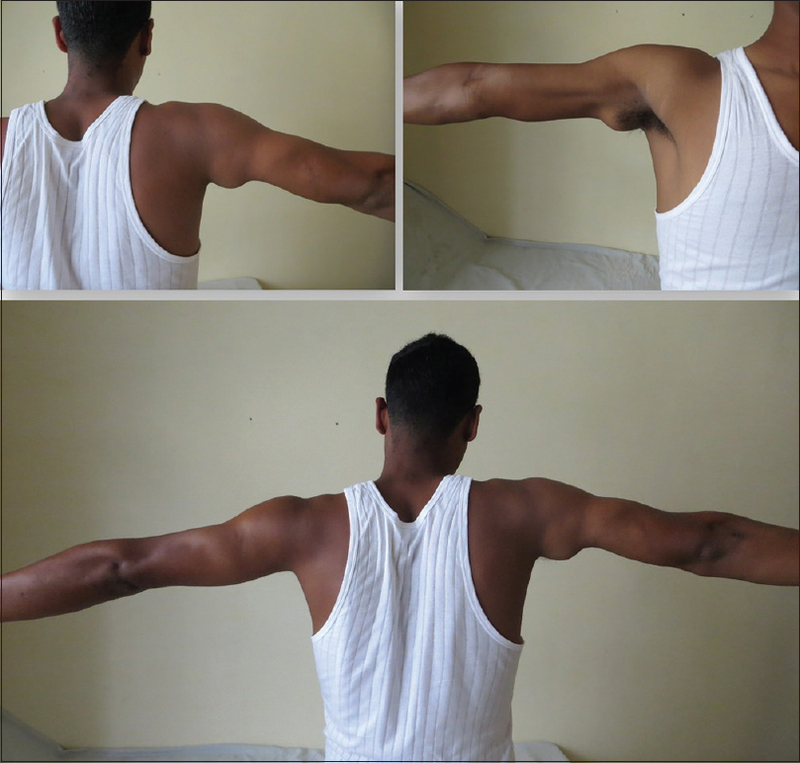 As the clinical picture suggested that medial aspect of posterior arm was deficient in muscle bulk corresponding to the mass; a diagnosis of partial triceps rupture was made. Magnetic resonance imaging (MRI) of the region showed myofascial scarring and edema in the distal myotendinous junction of the long head triceps suggesting chronic myotendinous avulsion with rest of the muscles of the arm normal in morphology and signal intensity. The subcutaneous plane and bones were normal [Figure 2]. As the patient had little functional deficit after retiring from active sports and was not willing for any further intervention; conservative care along with physical rehabilitation was advised to the patient as he performed activities of daily living without discomfort. As there was no history of fall or direct injury, extensive motions at the elbow during sport may be causes of triceps injury. Other notable factors in sportspersons may be systemic disorders and systemic or local anabolic steroid use. One of the sports-related triceps rupture at the similar site to our case was a weightlifter with recent steroid use. Olecranon bursitis is also one predisposing factor that may be found in sportspersons. A pediatric case with similar clinical picture to our case following waterskiing injury has been reported presenting 9 months after injury. MRI has been helpful in detecting partial triceps tears like that of isolated long head in sports injury scenario. Partial tears presenting late have no proper guidelines of treatment, and conservative approach is used in low demand cases in contrast to young and active patient where surgery is preferred. The importance of this short report is to acknowledge the presence of this entity while evaluating upper extremity sports injuries. This also highlights the importance of detailed history taking coupled with the clinical examination as foundation to definitive diagnosis. Waugh RL, Hathcock TA, Elliott JL. Ruptures of muscles and tendons with particular reference to rupture or elongation of long tendon, of biceps brachii with report of 50 cases. Surgery 1949;25:370-92. Anzel SH, Covey KW, Weiner AD, Lipscomb PR. Disruption of muscles and tendons; an analysis of 1, 014 cases. Surgery 1959;45:406-14. Stannard JP, Bucknell AL. Rupture of the triceps tendon associated with steroid injections. Am J Sports Med 1993;21:482-5. Bach BR Jr., Warren RF, Wickiewicz TL. Triceps rupture. A case report and literature review. Am J Sports Med 1987;15:285-9. Clayton ML, Thirupathy RG. Rupture of the triceps tendon with olecranon bursitis. A case report with a new method of repair. Clin Orthop Relat Res 1984;184:183-5. Sheps D, Black GB, Reed M, Davidson JM. Rupture of the long head of the triceps muscle in a child: Case report and review of the literature. J Trauma 1997;42:318-20. Clifford PD, Posada A, Hancock CR. Isolated long-head triceps brachii tendon avulsion in a surfer detected at MR imaging. Skeletal Radiol 2009;38:77-80. Inhofe PD, Moneim MS. Late presentation of triceps rupture. A case report and review of the literature. Am J Orthop (Belle Mead NJ) 1996;25:790-2.